A new international climate change agreement must avert catastrophic global warming, and the only way to do that is with a legally binding treaty, European Commissioner for Climate Action Connie Hedegaard said yesterday. In an interview with ClimateWire, Hedegaard said the European Union will insist upon an ambitious deal in 2015 that is legally binding for all countries, even if that is at odds with the Obama administration's efforts to develop a more voluntary agreement that does not need to be approved by the U.S. Congress. "Our own experience in Europe is, it helps when you have something binding and not just nice intentions. We also have this tradition in our international politics that it is not dangerous to have binding agreements. It's your assurance that if you make a deal with somebody else, you can be sure they are also delivering," Hedegaard said. "We know, of course, that the Americans have problems in getting the policies and the international binding agreements agreed and adopted in their Congress," she said. "We all know there is a real issue there. But I think that we also need to hear more from the Americans, not only about what they cannot do ... but really need the Americans to reflect on how far they will be able to go." Hedegaard's comments come as countries prepare for a U.N. climate change summit in New York on Sept. 23 that many hope will bring global attention to the new agreement. Countries have already agreed that the deal will be signed in Paris in December of 2015, go into effect in 2020 and for the first time demand action from all major greenhouse gas polluters. But a host of issues remain unresolved. Among them: What level of action should be expected of wealthy, longtime polluters like the United States compared to emerging powers like China; how much money will rich countries deliver to help poor and vulnerable nations adapt to risks posed by climate change and to develop clean energy systems; what legal form will the agreement take; and how deeply will countries be prepared to curb their emissions in the years after 2020? Hedegaard said the last two issues are intimately connected. The targets in the Paris deal must, she insisted, be consistent with keeping the global temperature increase to below 2 degrees Celsius above preindustrial levels, beyond which scientists predict catastrophic and irreversible changes. Averting the worst consequences of climate change, she argued, demands more than a voluntary approach in which countries contribute what they can and submit to reviews. 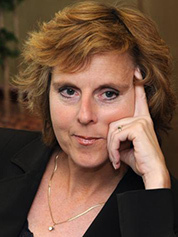 Connie Hedegaard, the E.U. commissioner for climate action. Photo courtesy of IISD Reporting Services. "If you only do it bottom-up, you have absolutely no guarantee that you will stay below the 2 degrees, and thus we will not have solved the job in front of us," she said. "If there is a gap when you put together what you say everybody is going to do, how are you going to solve that gap? That is where an international agreement comes in." Countries have agreed to unveil early next year their proposed targets for cutting emissions after 2020. The United States has proposed a system in which countries pledge whatever level of cuts they can agree upon domestically and submit those numbers to the U.N. system for monitoring and review. Over the ensuing months before Paris, the administration has argued, some combination of negotiations and "peer review" and global scrutiny might encourage countries to beef up those targets. Hedegaard acknowledged that the U.S. proposal would allow the administration to avoid the need for approval in the Senate -- where there is almost zero chance of lawmakers ratifying a treaty. But, she said, the United States also can't leave other nations to the mercy of shifting American politics. "I know there are real challenges in the U.S., but I also know a lot of countries in the world, including the most vulnerable, they do not want to see nice intentions in one administration in the U.S., just to be replaced a different year by someone who might have different views," she said. Hedegaard argued that countries have had four years to develop domestic support for ambitious climate action, since they agreed in Durban, South Africa, in 2011 to culminate 2015 in a new global deal. "The ambition for Paris must be something that still makes it likely we can stay below 2 degrees," she said. "Everybody has had more than enough time. Paris must mark the point where everybody understands why all of us have to stand on the top of our toes and stretch a bit to go to a collective effort."